DATAQ Instruments offers calibration services for most data acquisition and data logger products. Products usually include NIST-traceable calibration certificates upon initial purchase. To order a re-calibration of your DATAQ hardware, follow the instructions below. 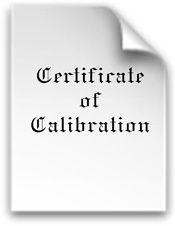 Order the appropriate calibration certificate through our online store (scroll down for ordering information). Once ordered, complete the DATAQ Instruments Recalibration Procedure form (pdf) referencing the order number from the original purchase of the device and print. Cut out the address label on the pdf form and paste to your packaging. Send the instrument with a copy of your order form in the package to DATAQ Instruments. When inquiring about the status of your order, have your order number handy for quick reference. Please Note: DATAQ Instruments does NOT recalibrate third party instruments (Lascar, Graphtec, etc.). If you need a third-party instrument recalibrated please contact the manufacturer. Please Note: You are responsible for shipping charges both directions and will be charged for return shipping charges through the online store when placing your order. NIST-traceable certificate for model DI-245 Thermocouple and Voltage data acquisition product. Includes before and after data. Shipping charges do apply when ordering online. Learn more about Calibrating your device. NIST-traceable certificate for model DI-2008 Thermocouple and Voltage data acquisition product. Includes before and after data. Shipping charges do apply when ordering online. Learn more about Calibrating your device. NIST-traceable certificate for model DI-808 Thermocouple and Voltage data logger product. Includes before and after data. Shipping charges do apply when ordering online. Learn more about Calibrating your device. NIST-traceable calibration certificate for all DI-730 data acquisition and data logger products. Shipping charges do apply when ordering online. Learn more about Calibrating your device. NIST-traceable calibration certificate for all DI-730 data acquisition and data logger products. Includes both "before" and "after" data. This item is NOT included with a new unit. Learn more about Calibrating your device. NIST-traceable certificate for all DI-1000TC data acquisition and data logger products. Does not include data. Shipping charges do apply when ordering online. Learn more about Calibrating your device. NIST-traceable calibration certificate for all DI-5001 data acquisition boards. Provides "after" data. Shipping charges do apply when ordering online. Learn more about Calibrating your device. Note: Pricing outside the U.S. will be higher to account for shipping, taxes, duty, currency fluctuation, local warranty and technical support in your country.